Spb Time is an advanced, skinnable time toolbox for your Pocket PC. Analog and digital clock modes, World clock, timers and stopwatches are combined in one application. Spb Time can work as a Screen Saver when the device is connected to external power. You may comfortably use Spb Time as a desktop clock when the device is in its cradle. Spb Time plug-in allows you to monitor time in your favorite cities. 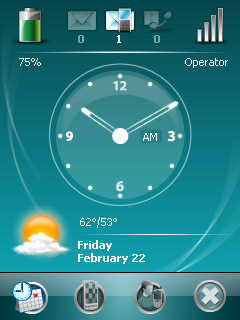 You can also add a nice clock applet to any tab of Spb Pocket Plus. A lot of time-related functions in this world''s bestselling application! Playing games is more interesting if you can compare your results with those of other people. Spb Software House along with PocketGamer.org has developed an open system for creating Pocket PC games that supports publishing high scores in web. 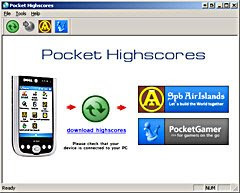 This system consists of a scores section of the PocketGamer.org website, a freeware program for desktop PC that retrieves high scores from the connected Pocket PC and a C++ library for creating Pocket PC games with high scores support. This article explains how to use this library in your games. Spb GPRS Monitor is a complete solution for measuring the amounts of data transfers via your GPRS, CDMA or GSM network connection and calculating network usage costs. Spb GPRS Monitor monitors all data transfers you perform and calculates the cost of your GPRS usage taking into account your service plan details: inclusive data amount, data block size. etc. ContactBreeze combines a set of innovative tools, including a large thumbs keyboard, T9 searching, complete one-handed navigation, special PIM dialing extensions for your default Calendar and Tasks applications and much more! Contact Searching: ContactBreeze uses T9 searching, a dynamic search method used on most mobile phones. Each time you press a search button, ContactBreeze will display all contacts and one of the pressed button letters. As you tap more letter keys, only contacts containing that letter sequence will appear. Locating a contact from a list of 500 contacts will usually require only 3 taps. Optional large thumbs keyboard or compact keyboard to search for contacts. Latin, Cyrillic, Hebrew and Geek alphabets support. Clicking the dial button on Windows Mobile Professional devices will initiate a call to the selected contact. Clicking the D-Pad action button will open an expanded contact view. - View all your contacts on your Today screen! - Search your contacts using sequence or initial search! - Easily switch to full screen mode to search for contacts "on the fly" without using your stylus! 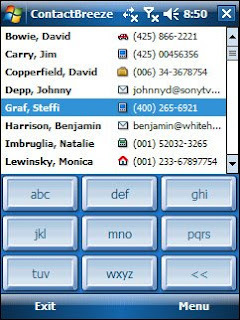 - Browse through your contacts using the Pocket PC D-Pad! - Open and edit your contacts in your favorite PIM: Pocket Informant, Agenda Fusion, or Pocket Outlook! - Contacts are dynamically loaded - PPC memory is only used while viewing the contacts, and then immediately released! iLauncher is an all-in-one application that brings the most powerful utilities that are missing from the Pocket PC operating system to your Pocket PC device in one package. 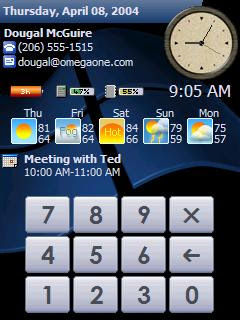 These include: A tab-based launcher Today screen plugin with various information widgets such as battery and memory meters, speed dial shortcuts, screen capture utility and more; A task manager context menu that allows you to track and control the current active applications; A true 'X' button functionality that really shuts-down running applications as opposed to simply minimizing them; A safe-mode protection utility that makes sure your device will always initialize correctly and much more! *NEW! - Thumb Tabs layout for optimized for thumb navigation. *NEW! - Floating Panels technology! Maximize your Today screen experience! - Add meters to tabs: Memory, Battery, File Store, SD Card, CF Card and backup battery. Add control panel shortcuts. 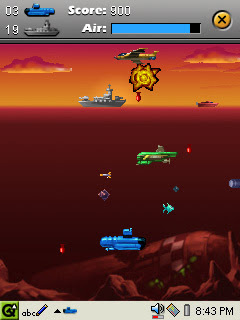 The popular web game Sea Strike is now available for your Pocket PC. An action packed battle of the sea where you must destroy the enemy while they are trying to destroy you! Avoid the methodical pounding of the depth charges, the seeking enemy submarines, the treacherous mines, and the bombs from above. With a limitied air supply, you'll have to refill by catching fish. - Evade Bombs from above. - Limited air supply - you'll have to refill by catching fish. · Pocket PC 2000/2002 devices. · Devices with game pads. WINNER in the "Chess Games" category of the POCKET PC BEST SOFTWARE AWARDS 2003 , 2005 and now 2007 ! Featuring an extremely strong chess engine with an opening book of 200,000 moves and plays interesting and often aggressive chess. The engine is a successor to the program finishing 4th in the World Microcomputer Chess Championships 2001, winning the title of the 18th World Microcomputer Amateur Chess Champion. The year is 1972. As a Kung Fu actor in Hong Kong, you have been cast as a young farmer's son, out to avenge his father's death at the hands of an evil tyrant. As this is a 70s Kung Fu film, there is little dialogue - what is important is the action! 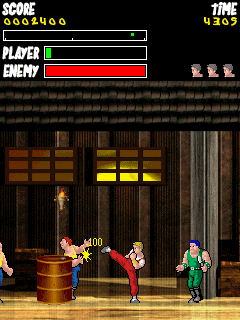 Playing the part of Chang Pei, you must fight your way through hordes of Shao Ping's henchmen, each a master in the Martial Arts, who are guarding his palace. After fighting your way through these guards, you must take on the end of level boss - but beware, each boss has abilities far surpassing those of their minions! Can you fight your way through each of the chambers and defeat the big boss? Does it ever happen to you that you forget names? For example, you hear a well known song from a well known performer, but right in that instant you can't figure out their name? Or you can't even remember your own telephone number? Well, the majority of other people have the same problem and it gets worse with age. How about doing something about it? Just like it's possible to keep in good physical shape, it's also possible to achieve the same with your brain. You need to excercise! Give up 5 minutes of your time each day to maintain and even improve your mental capabilities. Resco Brain Gain will be your reliable trainer. the favorite image viewing application has just made storing photo albums and editing pictures easier and more enjoyable. The professional version has been specially designed for people working as photographers, journalists or anywhere else in the media where they need such a tool handy at all times. 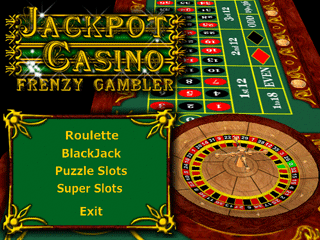 You start the game with 500 units of money, and can move from one game to another freely betting from this single pot. If you exit the game the pot will be the same size when you re-enter. If you run out of money you can't take part in any of the games, except weirdly Video Poker which does give you the chance to win some money back (and even lets you get a negative balance). You can also reset your balance back to 500 at any time. 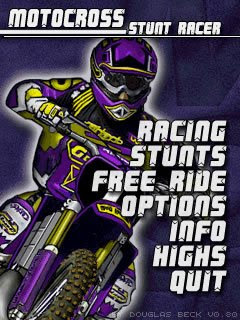 Motocross Stunt Racer is an addictive fast-action motocross game featuring great graphics and sound, tons of levels, and awesome gameplay that will keep you coming back for more! After many months of development, Motocross Stunt Racer has been released. Delivering liquid smooth 3D gaming, full 3D models, real-time shadow casting & surface removal, a full physics system, and enough levels to choke on--it's all in there. 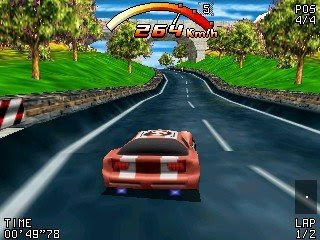 The game features three types of riding: racing, stunts, and free ride. Mastering the controls and details of each racing type is key to unlocking all 45 levels. And with rider profiles, starting where you left off and keeping track of your progress is a snap. - 45 beautifully crafted levels! - Voxel technology brings the game to life. - Super-fluid animation, real-time shadows, and awesome frame rates. - Realistic physics and gameplay. - Three modes of play: Racing, Stunts, and Free Ride. - Control with the stylus or gamepad. - Configurable buttons and persistent settings. - Playable in both portrait or landscape device orientations. - Real-time device orientation & gamma correction. GameBox Solitaire is an amazing high quality card game pack including 10 well-known card games. Incredible graphics, high quality music and sound effects, smooth card animations, alpha effects and fantastic playability makes this a long standing best-seller for Windows Mobile Professional, Classic and Pocket PC devices. - Hint feature: A new hint feature will help you learn into the games faster and notice possible moves easier. - Ambient music: Three sound tracks totalling over 15 minutes made by Jason Surguine, the well-known PDA musician. - Detailed options: Detailed options let you change how cards are sorted, dealt, moved, flipped and played. 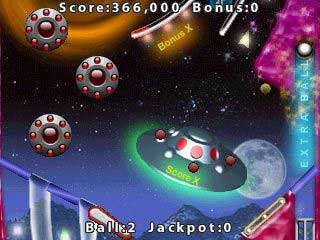 The game features a particle engine used to create aliens, explosions and other onscreen effects. - Parallax scrolling backgrounds with merge effects. Journal Bar downloads data from the Internet when your Pocket PC is connected to your PC, and your PC is connected to the Internet. Don't worry about changing options to make this work, Journal Bar works right out of the box - all you do is install and go! Enter your ZIP code for local weather, local news, and local movie listing information. Customize Journal Bar to remove the information you don't want to see. Auto scroll through the information so you can quickly see it from the docking cradle. Change how often the information is automatically updated. Works perfectly with Phone Edition, Bluetooth & 802.11 devices for updating on the go. 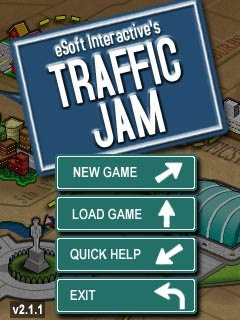 Traffic Jam is a puzzle game that's guaranteed to keep you glued to your Pocket PC for hours! 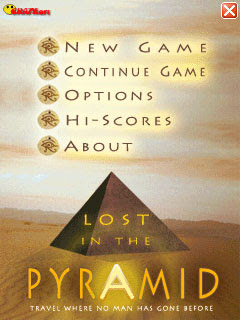 Lost in the Pyramid is a fresh idea that brings back memories from the old, funny adventure games. Your character is an archeologist which discovers a brand new Pyramid. Your task is to enter the Pyramid, explore it, unravel its mysteries and try not to die. • Fully translated into several languages. • Hilarious story and humorous dialogs. • Many rooms to explore. • Easy point and click game play with interactive inventory. • Export your Hi-Score online and compare it with everybody. Play Texas Hold'em any where you want using Aces Tournament Timer! Don't use your old wristwatch, drag around an old laptop, use the new Aces Tournament Timer on your mobile phone or PDA. Easy and convenient, the new Aces Tournament Timer for Texas Hold'em allows you to bring the game everywhere! Texas Hold'em is sweeping the world, showing up on television, in casinos, and at home! Run your home game or tournament using the new Aces Tournament Timer. It has a large timer which will show you exactly how much time is left before the blinds go up. It also shows what the current blinds are and what the next set of blinds will be! Use the pre-defined tournaments, or modify/create the game to the way you want to play it. - Large timer screen that shows timer, current blind, and next blind. - Sound options for an audio reminder. - Portrait or landscape mode. - Automatically start tournament on startup. - Pause in between blind rounds or allow timer to keep running. - Set the backlight to stay on or allow it to go off to save battery life. - Create different tournament settings, saving them for future use. - Use predefined tournament settings. Take control of one of the three racing cars of Raging Thunder and feel power and adrenalin in your blood. Drive at top speed on a variety of tracks set in different beautifully realized environments. Be good and upgrade your car, unlock racing circuits and challenge stronger opponents. Enjoy the immersive gameplay mechanics, the precise controls and the rich, beautiful graphics of Raging Thunder and play for 10 minutes or for hours with the same excitement!! - Not a realistic racing simulator, Raging Thunder is a game based on tried and true arcade values. Speed, accessibility and fun, in other words, trump the limitations imposed by so called ‘real world physics’. - In the world of Raging Thunder there are no such things as ‘too narrow turns’ or ‘impossible overtakes’ (and luckily, definitely no such things as ‘traffic control officers’). Marble Worlds is a highly addictive and challenging platform game. The gameplay takes place in a varied set of worlds depicted in isometric 3D (viewed from a fixed 45 degree angle). The object is to guide a marble through the worlds collecting all the gems as you go to advance to the next level. 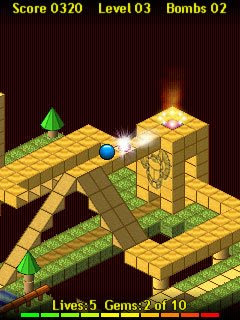 The marble rolls around the scenery with a realistic sense of movement, speeding down hills, and climbing up ramps, bouncing off walls and jumping under your control. Multiple scrolling play areas make a world, and there are 10 worlds to complete, giving you hours of fun. Fantastic graphics sets including Castle, Egypt, Metal Blocks and Computerized. 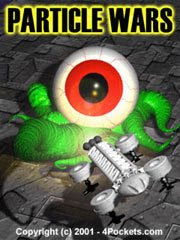 - Fantastic graphics sets including "Castle", "Egypt", "Metal Blocks" and "Computerized"
For those of us who enjoy playing some quick pinball on a regular basis, it’s always nice to see a new pinball title on the Pocket PC. Mobilair’s Creepy Pinball takes a rather simple and traditional route, but delivers a pretty good table regardless. There’s just one table, and it’s played on a single screen. I personally consider the single screen system to be a plus. The titles that zoom on the pinball and pan around the table can be rather distracting, there’s really no reason it can’t be fit on the screen. There are very little gimmicks or tricks to this table, just some bumpers, a few ramps, and a 3 ball multiball lock. Pretty good, but not altogether very deep. The targets and ramps do make for a good challenge, even if it can get a little annoying watching the two jump pads play catch with each other for awhile from time to time. Sudoku is a logical puzzle game featuring a 9x9 grid. Within the grid are 9 boxes each featuring 9 cells. The object is to fill in the numbers 1-9 in each row, column and box, but they must only appear in each one once. Suitable for all players from beginners through to experts and six levels of difficulty, Astraware Sudoku is packed with features. All users of Linux now have a new great game - Challenge Checkers! The game is a wonderful training for you logic force and strategy skills. You play with your device or with your partner, getting more and more experience on several skill levels. 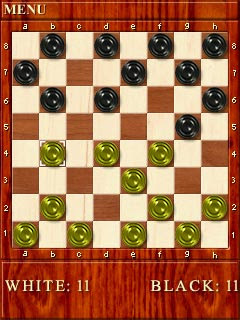 Enjoy also great graphics and sound - endless pleasure for devoted chess player of any age. A real challenge for all checkers masters! 4Pinball takes pinball on the Pocket PC to new levels with fast, smooth, vertically scrolling hi-colour tables, much larger than the screen area of your PPC. 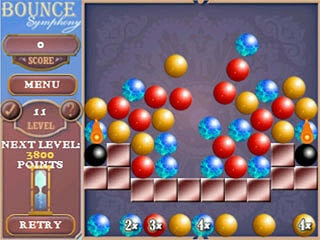 This addictive and highly challenging game is possibly the most fun you'll have on your Pocket PC. We've never seen so many people in the 4Pockets office volunteer for testing! Just read our extensive feature list below to see what this amazing game offers. 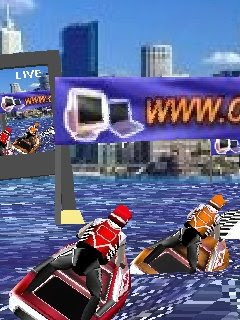 Mini-Aquabike is a unique 3D watercraft racing game featuring two types of exciting watercraft racing - Runabout Class (speed race) and Jet-ski Class (obstacle race). Unique 3D rendering effect features sophisticated light effect, metallic and shiny watercraft, dynamic racer postures, and fluid 3D waterway creation. You can compete on one of 5 aquabike racing circuits featuring distinct scenery. With simplified racing rules and easier steering control, everybody can be a master of aquabike racing. Enjoy spills and chills, experience roaring and flying, prove yourself an aquabike ace. TouchPal is an innovative soft keyboard powered by T+ input technology. Now, TouchPal v2.0 is coming with more great features! Input punctuations and digits without view switching new! Dynamic resizable layout (enlarged/normal/reduced) new! "My sentences" with parameters (e.g., "See you in X mins") new! "My commands" (e.g., Undo, Select All+Copy, ...) new! Customizable emotion symbols (e.g. :-o, ^_^) new! Toss aside your perceptions of puzzle games and throw down with the most unique physics of any Pocket PC game! Use your stylus to manipulate 3D spheres and toss them around until you align five or more! What happens next is almost magical! The Victorian look, the slick physics on the ball movement and the relaxing orchestral score make this a blissful gaming experience! A game you just can't put down! Candy Catchup is simplicity itself. When you click three or more connected candies of the same color, they explode. As the level increases, you need to destroy more candies to gain extra time and survive. Earn big points by destroying a large number of candies at the once. Think you got a great high score? Compare it with the entire Pocket PC community through the online scoring system! - Four levels - from "Easy peasy" to "Tough as nails"
- Different full color backgroundsChallenge yourself to this totally addictive version of Dominoes! Mindmapping is already a well known technique to create and organize complex concepts or to do brainstorming. A computer combines the graphical expressiveness of the Mindmap with the computer's strength to restructure, search, move or copy and paste the content. And software can even do more: Keep track of your tasks associated with the concept, focus on specific topics, filter your topics according to certain attributes or export them to XML, HTML or Text - with Pocket Mindmap you have this strong team of tools always with you - in your Pocket PC. - New Toolbar in "Add Multiple" dialog. - Supports the keyword search of the Pocket PC 2002 help. 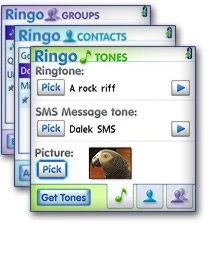 - Use MP3 music you already own as your ringtone! - Personalize your phone, the easy way! Displays Battery, Memory, Storage Card, Network connection, Time, World Time & backlight data on the today screen. Tap on each section for detailed info. Speaks to you when your battery, memory or storage cards are low. Battery Bar shows battery remaining in hours & minutes, tailored to how you use your Pocket PC. Launch programs from your today screen. Tab view allows as many program links as you wish. Host other today plug-ins as a tab in Program Bar to save valuable screen real-estate. 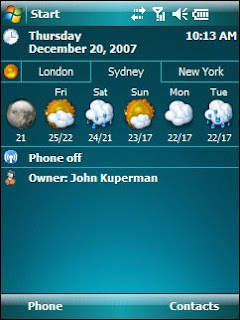 phoneAlarm is a Today screen plugin - giving you total control over your Windows Mobile Phone. Never miss an important call, SMS or email again. Automatically switch profiles and quickly access Inbox, call history and control the state of bluetooth directly from the Today screen. Optimised for one-handed and in-car use. phoneAlarm Lite is also available offering all major features with a simplified setup which is suitable for larger installations and low-maintenance! - 7 Custom Phone profiles with manual / time-based automatic switching. - Icons provide direct access to Inbox, missed call history etc. Manage your busy agenda using the all new PocketBreeze, placing your important agenda information directly on your Today screen wrapped with a stylish design that will guarantee a dramatic improvement in your daily productivity! PocketBreeze is a tab-based Today screen plugin featuring tabs for: Calendar, Tasks, Notes, Contacts, Messages and Special Events. PocketBreeze brings your most important information directly to your Today screen, making sure you'll never miss an upcoming appointment again! Designed especially for use with mobile devices featuring complete one-hand navigation, modify/create items with intuitive operations, QWERTY keyboard device support, square screen support and much more! - NEW! MyList integartion! Manage all of your lists directly from PocketBreeze Notes tab! - Create new notes using templates and convert regular notes to new templates! PocketWeather is the best weather tracking solution for Windows Mobile devices! Featuring a robust weather engine wrapped with a stylish and easy to use interface. Including a customizable Today plug-in that helps you view the weather in multiple locations and the powerful WeatherConsole for advanced weather information with details such as: humidity, wind details, cloud layers, METAR stations information, earthquake details and much more! 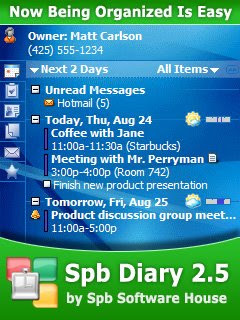 Spb Diary is a feature-rich Today plug-in for your Calendar, Tasks, Contacts, Notes and Messages. It enhances Pocket Outlook by gathering all of your PIM information in one place. With Spb Diary, the Today screen will soon become your favorite since you will need to leave it less and less. had a similar type of locking system on my device, but when i trialled this one it was easier to lock/unlock and has a far superior look to the whole program. I have since purchased it,and am looking forward to the next inovation to join with battery pack & journal bar.Keep up the Good Work. - Password program you will actually use! Pocket PC is a popular platform for mobile devices that supports a wide range of multimedia features. Flash Player 7 for Pocket PC enables developers and publishers to quickly and easily deploy rich interactive Flash content and applications for Windows Mobile 5 and Pocket PC 2003 devices. Developers can view Flash content within Pocket IE or full-screen using third-party software, or deploy stand-alone Flash applications, which requires the Distribution Kit. Spb Finance is a financial manager that you can carry in your pocket. You don't have to write down all your day's expenses and transfer them to your desktop PC financial manager later. Enter your expenses into Spb Finance on the spot and forget about them, Spb Finance will remember them for you. Entering a transaction is a two-click business, since Spb Finance has a built-in autocompletion feature. Do you use Microsoft Money or Quicken at your desktop? Spb Finance has special features for synchronization with these products. Now that you have a Pocket PC 2002, why not personalize it using the new Themes capability? It's super easy to build your own using the Theme Generator PowerToy. 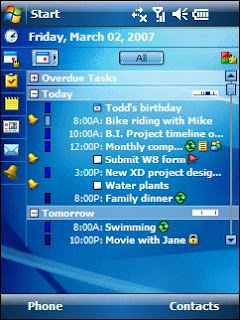 Pocket PC 2002 Themes give you control over the look and feel of your Pocket PC 2002. 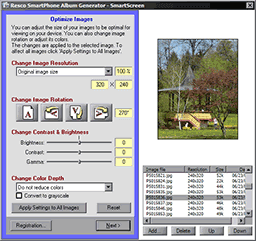 The Theme Generator allows you to choose the background picture, the start menu graphic, and assign colors to menus, messages, and navigation bars. Once you have created some great themes they can be easily applied. You can also share them with other Pocket PC 2002 owners simply by beaming them to each other. I hope that everyone has already use Spb shell v1.5 and knows how interesting it is. Now you will feel more interesting with it such as destop 3D. Try yourself to proof what i say. Easy to use Photo Speed Dial gives you the most pleasant way to dial. In the context menu you can choose a phone number to dial or change the default number. Pocket PC & Smartphone Magazine's Poker Game of the Year in both 2005 and 2006. 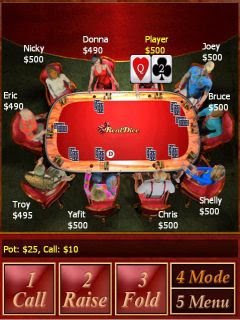 Play mobile Texas Hold'em the way it was meant to be: online against thousands of real players from around the world. Full tables 24/7, ring games, tournaments and multi-table events. Multiplayer Championship Poker is in a league of its own. Chesscapade™ is a fun, action packed next generation chess game featuring groundbreaking 3D battle animations, real-time multi-player gaming across the network and four different play modes from "AI challenge" to "challenge a friend across the network". All pieces are fully animated and taking an opponent's piece turns into a cinematic experience as you watch your side crush the opposition with piece specific animations. Challenge buddies or let Chesscapade pick a similar strength opponent calculated from your server-based ranking. 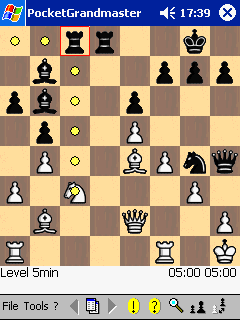 - Chess engine developed by Russian experts in chess strategy and AI. - Move history in chess notation. - On screen material record (pieces taken). Spore Cubes Deluxe is an easy yet addictive puzzle game. 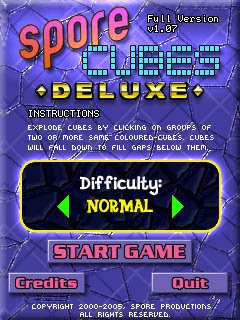 The objective is to clear all cubes by selecting same-colored groups of cubes. The game comes with 4 skill levels plus one secret level. Since this is the Deluxe version, you also get Puzzle mode with 15 puzzles, and that's not all! 3 more game modes to keep you challenged! Pusher, Slammer and Squeezer modes will keep you from ever getting bored with Spore Cubes Deluxe. You will enjoy hours of fun with your entire family. Perfect for an on-the-road time waster. 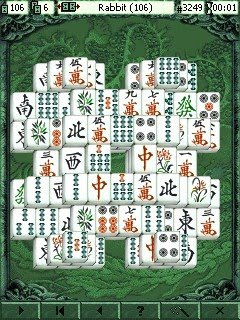 Shanghai Pocket Essentials is a modern, solitaire version of the same named ancient oriental game, based on Activision's Shanghai Mah-Jongg series. LandWare has brought the graphics and play options to the handheld platform. Built on a custom engine using standard Activision graphics and layouts, the handheld version brings desktop game performance to your handheld. You can even create your own layouts, up to five levels deep, right on your handheld. Shanghai now comes to life with its support of the new handheld's high-density 320x320 pixel screen. Rewritten to take advantage of high-resolution graphics, Shanghai's graphic enhancements make title sets incredibly life like. The program faithfully reproduces the beautiful graphics of Activision's original desktop classic. Shanghai® Pocket Essentials provides you with nine high-quality tile sets. You can switch tile sets at any time by selecting your choice from the preferences. Some tile sets have exact matching pieces, while others (like Mathematics) match through logical pairs (i.e. 8+5, 13). Choose from over 100 of Activision's standard Shanghai layouts categorized in six groups: Kid Layouts, Quickies Advanced, Quickies Normal, Standard Advanced, Standard Easy, and Standard Normal. Choose a layout yourself or let Shanghai surprise you by randomly selecting the layout for your next game. Want to spin your own layout? You can with the built-in layout editor. Create a new layout from scratch or get a head start by copying one of the many built-in standard Activision layouts. Create your own challenging design simply by tapping on the screen, stacking them up to 5 tiles high. In addition to the standard Shanghai mode (select movable matching pairs) and Contemplation (same rules, but the tiles are face down), you have two additional choices: Path 2D where you can only remove matching pairs that can be connected by a line with two or fewer turn and must be on the same plain, or Path 3D which has the same rules as Path 2D but the tiles can be on any plain. Are you up to the challenge? Play with 36 unique tiles or simplify things by using only 24 unique tiles. The choice is yours but either way, you're in for hours of fun. 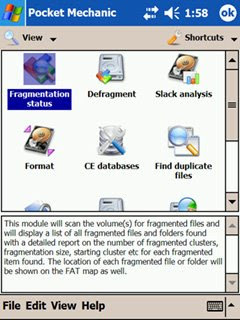 LingvoSoft Talking Dictionary 2006 Free English<->Turkish for Pocket PC provides bidirectional word translation and English speech synthesis - with a compact and concise database of words and phrases. Featuring 12,000 entries, this is a simple and efficient application, which will provide you with answers to most of your translation questions and immediate practical help when faced with a communication challenge requiring an instant response. Able to pronounce words in English, the innovative Text-to-Speech feature is built on advanced human voice modeling. Now you no longer need to speak out transcriptions - simply select a word and with a touch of the screen, have your device pronounce it for you.